This Castle Slide/Bouncer combo brings an air of majesty and imagination to any event. With a pair of regal blue and red towers and sunny-colored walls, this bouncy castle is sure to attract little princes and princesses for hours on end! Each player can enjoy action on a wet or dry slide, or conduct their royal duties from the large interior jump. This castle combo offers up to four different activities for endless hours of activity including a large interior jumping area, a basketball hoop for group interaction, and climb to conquer with a fun and fast slide, entertainment for even the most active child! High-visibility mesh allows spectators to keep an eye on participants. Manufactured with lite n strong , fire resistant vinyl for safety, durability and portability for any indoor and outdoor party. **COMBO UNIT MAY BE USED "WET" DURING APRIL-OCTOBER, CUSTOMER RESPONSIBLE FOR PROVIDING THEIR OWN WATER HOSE AND WATER SPIGOT. **includes (4) stakes and (1) blower. 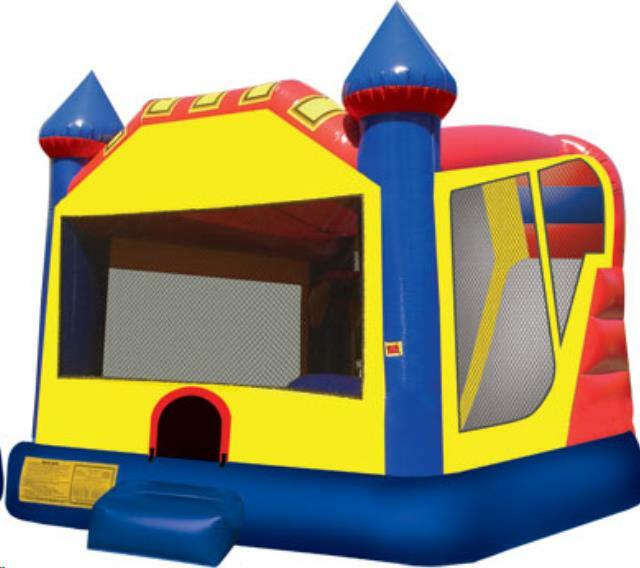 * Please call us for any questions on our castle wet/dry slide/bounce combo rentals in Rocky Mount and Wilson NC.